Hello! I am unable to sleep this fine Sunday morning, so I thought i would post a couple of really quick cards I made. My most recent PTI order arrived and I wanted to play with my new stuff. 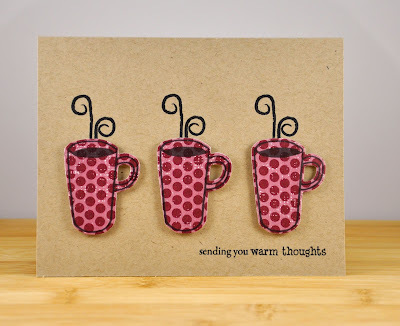 I ordered the "warm happiness", "warm happiness too" stamp sets along with the matching dies. 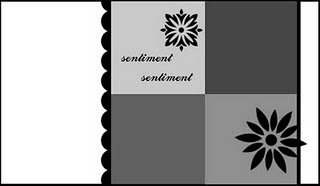 The paper on the first card is Basic Grey (I think) and the sentiment is Hero Arts. Everything else is Papertrey Ink. I just LOVE these sets. And how perfect are the dies?? SO happy. 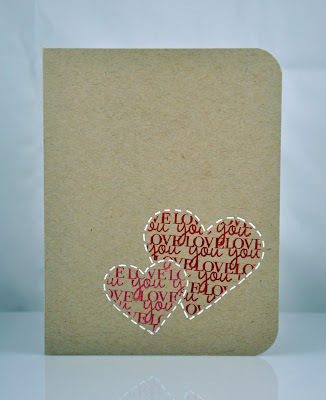 Well I guess I totally goofed on the Papertrey Ink blog hop. I thought the blog hop happened on the 26th. Oh well. There are some fabulous creations this month! My card is one that came about because I wanted to use this really pretty ribbon I found and tie it up with some twine. That's kinda where my vision stopped because together they seemed vintage-y or shabby. Neither of which I am good at. :) But I think it came together in the end anyway. I was able to use up a lot of scraps to make this one, or rather things that were already ready to use. 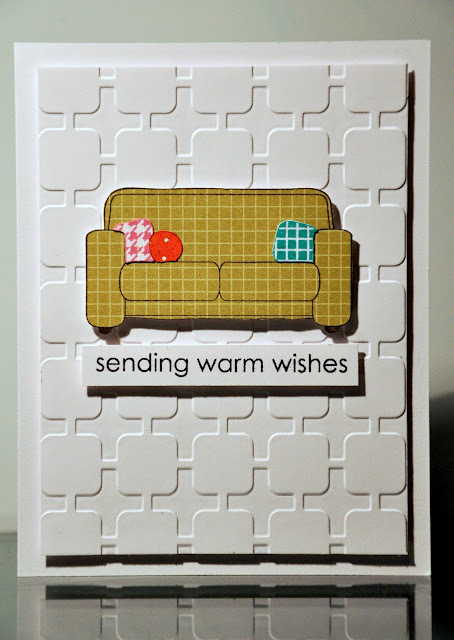 The dotted paper had already been cut using PTI's spiral notebook die, as I was trying to use it on another card but had decided against it. The clouds I had already cut out with some scraps of felt I wanted to use up. 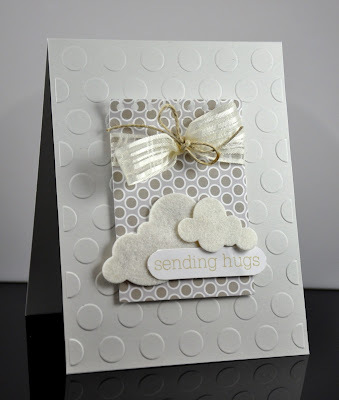 The base is PTI's soft stone and the patterned paper is one of their Colour Couture downloads. I thought this worked out well for the Moxie Fab World Colour Inspiration Challenge: neutrals. I am excited that I remembered to participate this month! might be collecting a little dust! Go through your stash and see what little used treasure it might hold." So I looked through my Papertrey stamps and found the first PTI set I ever bought, and sadly had not yet used. Wise Owl & Wise Owl Bellies. 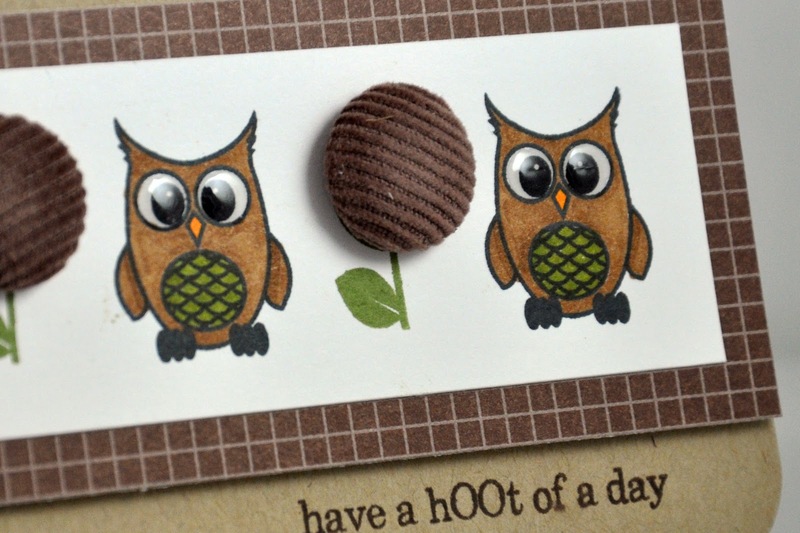 I love owls, only second to giraffes. Remember when they were all the rage? I was so excited that owls were everywhere. I can't wait to see the rest of the bloghop. Thanks for stopping by. 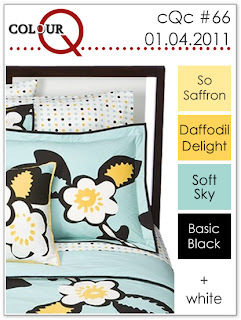 Today I bring you yet another fabulous colour combo courtesy of Arielle over at ColourQ. I absolutely adore this colour combo. Now I know I say that a lot, but seriously, isn't it great? All the warm tones with the stark of the white. For some reason the purple is just fabulous with the warm oranges. All of my colours are Papertry Ink. Kraft, plum pudding, terracotta tile and melon berry. 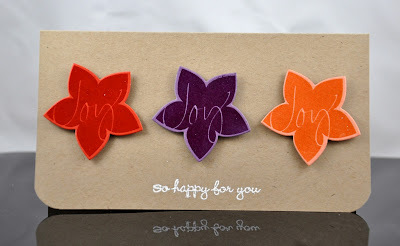 I stamped the flower in versamark then embossed with clear powder. I love the tone on tone it created. Unfortunately the white emboosed sentiment came out a little sloppy. I keep forgetting to try wiping with the paper a bounce sheet or something first. 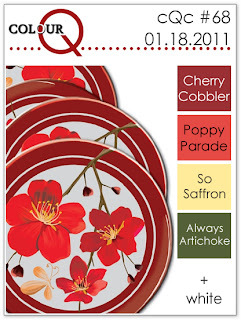 Head on over to ColourQ to see what the rest of the AMAZING design team has come up with. We now have some utterly fantastic scrapbook layout designers to feast your eyes on. A friend of my husband's birthday is this weekend so I needed a quick birthday card. 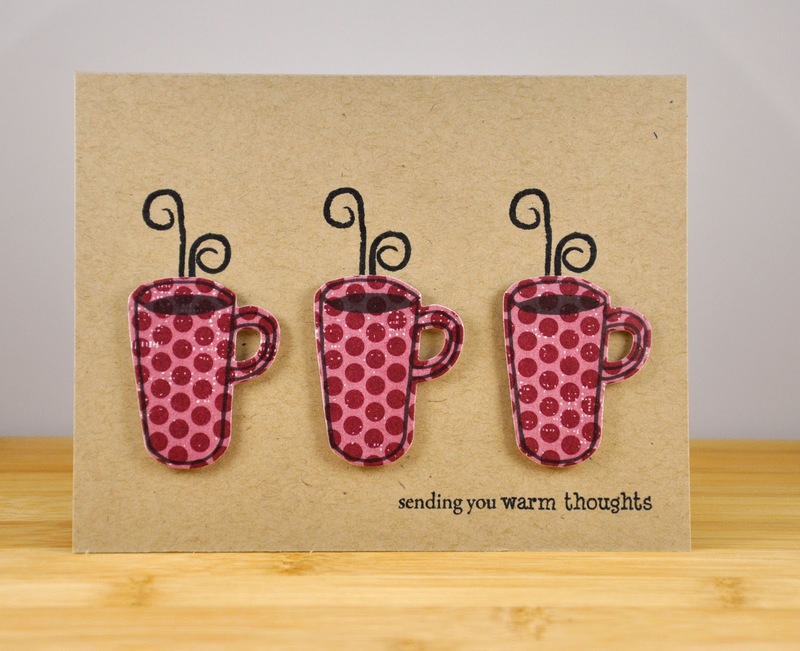 And while I am patiently waiting for my latest order from Papertrey Ink (which was ALL birthday stuff!) I hunted through my collection to find something that might work. 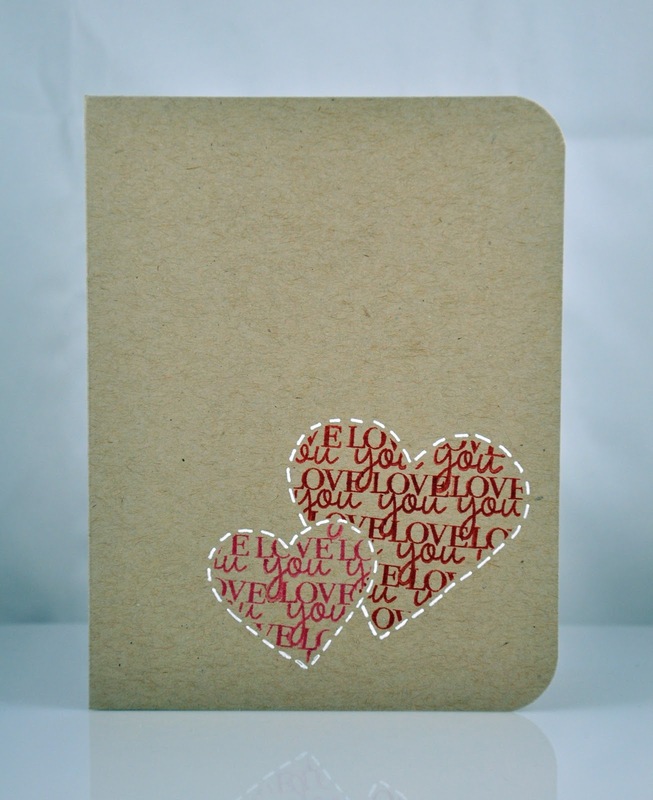 I found a couple of sentiments from a Close To My Heart set I have, a sort of inside and out set. 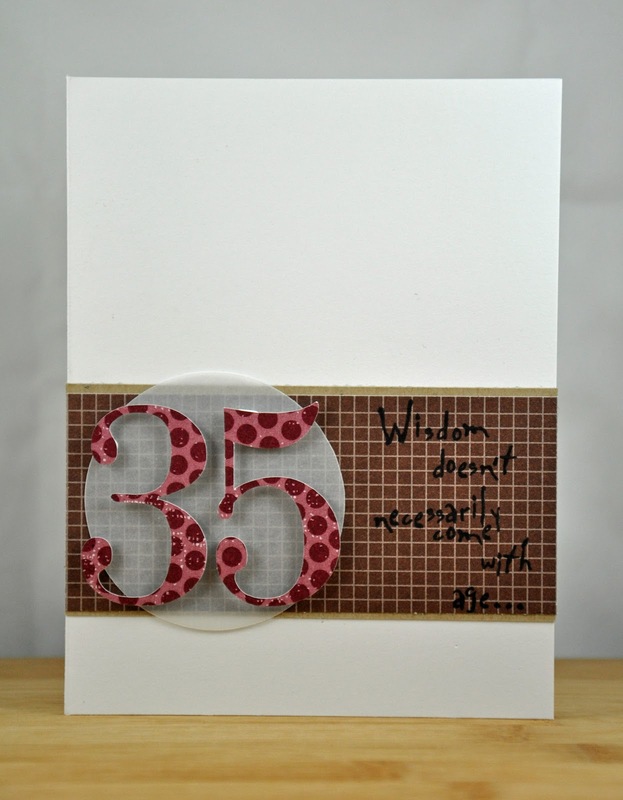 I took my inspiration from a card that Nicole Heady created with some of PTI's new birthday stuff. I ordered the number dies which I love to have for felt and other mediums, but these ones I just cut out with my Silhouette. The inside says "sometimes age just shows up all by it's self". In her case it most definately did come with age! She's a very smart cookie! Hello! 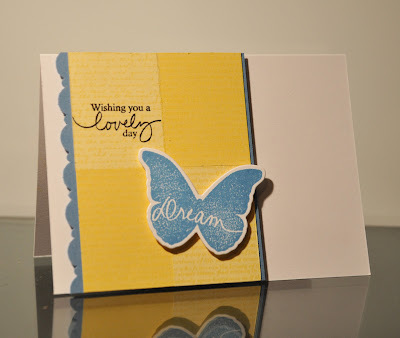 This weeks Clean and Simple challenge over at Splitcoast is to CASE a card done by cindybstampin. You can see the original card she created here. 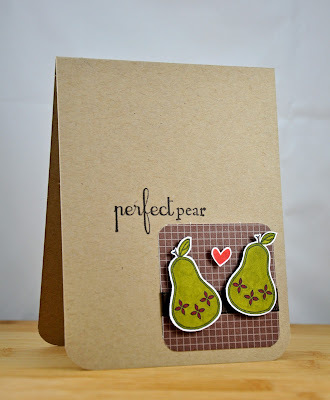 I loved the fruit on her card so I found a Unity stamp (July09 KOM) and used it to create this little card. 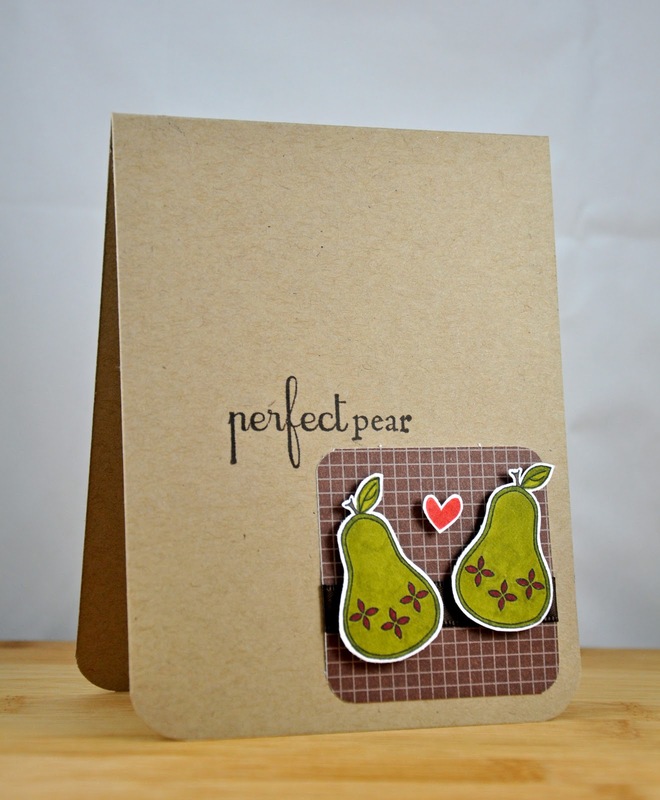 I coloured the pears in with copics and pop-dotted them on to some papertrey ink bitty box patterned paper. The sentiments are Unity as well, from a different KOM (June 09). 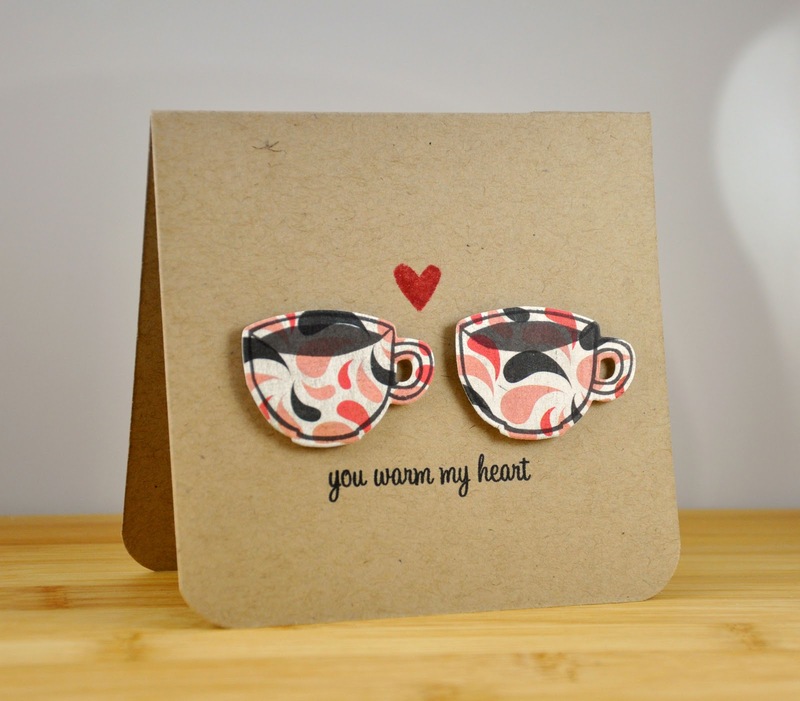 I thought this might make a cute valentine's day, anniversary or possibly even a wedding card. edited to add: If I had read the fine print I also would have noticed that we were supposed to have used more than 1 sentiment! Oops! I don't know for sure if this counts, but I made this for Simplicity's One Layer Wednesday challenge. 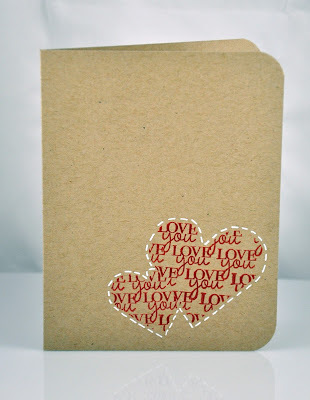 I used 2 different sized hearts dies by spellbinders and used the negative space to lay over the base and stamp. Only problem is, on the first one, I meant to have the smaller heart overlap the bigger heart. I masked in the wrong order. Ooops! Oh well, I think it turned out OK anyway. It looked a little lost with no border so I put some white faux stitching around the edges so the hearts were a little more apparent. p.s. the inks are actually a pink & a red, hard to tell in the photo. If you click on the image to see closer you might be able to tell. 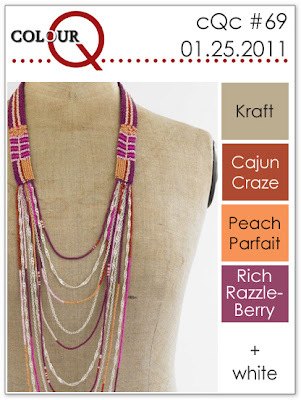 I bring you this weeks ColourQ challenge, yet another fabulous combo. 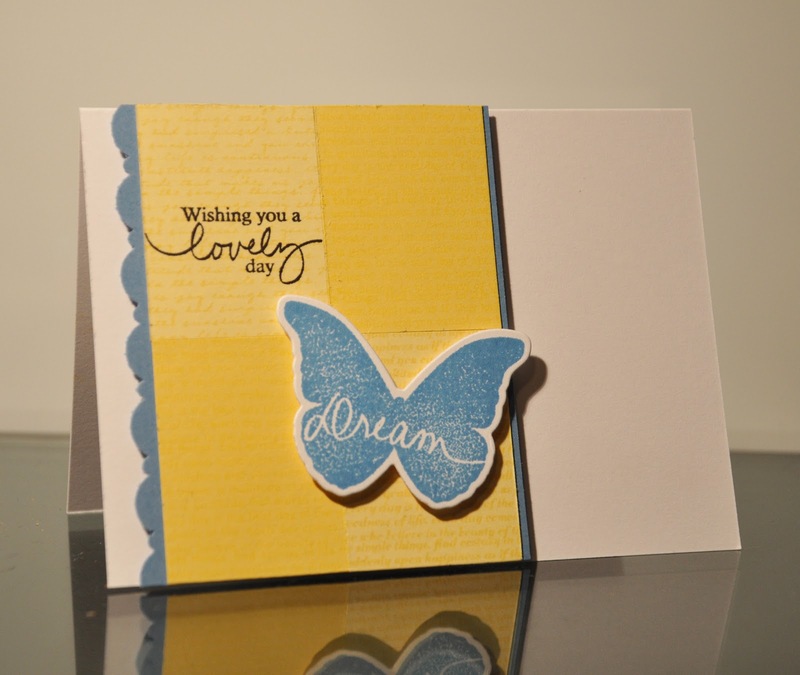 I really like this combo but had some trouble figuring out how to get that soft yellow in there. 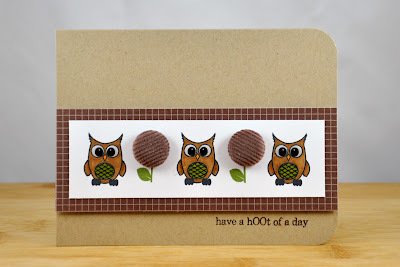 I don't have any Stampin Up colours, so this was the closest I could come up with. Unfortunately the lighting in my photo makes the reds look a little more pink than they actually are, sorry. 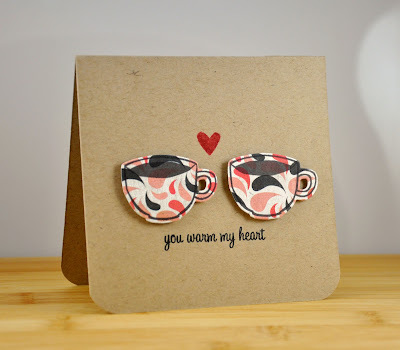 All supplies are Papertry Ink except the sentiment which is Hero Arts. Head on over to the ColourQ blog and be amazed by the fabulous design team's inspiration for you this week, then play along. 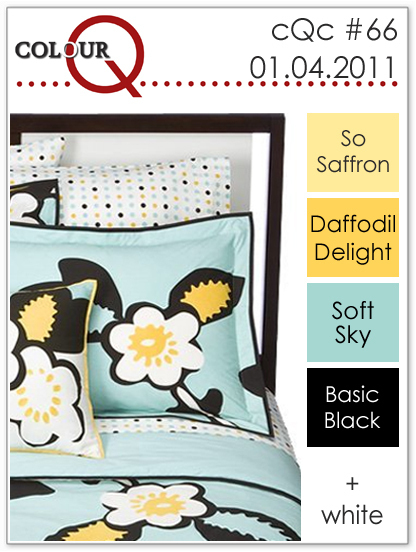 It's time for another ColourQ Colour challenge and this week's colours are so bright and pretty. Arielle comes up with the most fastastic colour schemes! Isn't that little tutu adorable!? I am quite intimidated by bright colours. I do love them, but I have trouble working with them, in all aspects of my life! I wear a lot of neutrals, our house is (for now) a lot of neutrals. I like to bring in a pop of colour, an accessory or two you know? I figure it's a great way to, inexpensively, change things up fairly regularly. If it's just little things. To make a long story short, that is why my card is just a "pop" of colour! I think my new mantra, motto, resolution, what-have-you is going to be trying to break out of my comfort zone. But....Check out the AMAZING cards and layouts that the ColourQ design team have created as inspiration. Let me tell you NONE of them are afraid of colour! So check it out then play along. I can't wait to see what you come up with! I hope that everyone had a wonderful holidays! I am just back from Ontario, visiting family, as it was my Grandpa's 90th birthday on Monday. We had a buffet dinner on the saturday, & an open house tea party on the Sunday. With a fantastic turnout I might add! He still lives on his own, still carves (wood animals) and has very few health problems, we are all so grateful for this. He is such a wonderful man, who has been through a lot, including outliving his wife and one of his daughters. ﻿All supplies are Papertrey Ink, but the ink! It's really hard to tell but the yellow pieces have been stamped with different text styles from PTI's "text style" sets. The colours I used are lemon tart, harvest gold, and blueberry sky.